People like their dogs a lot. And who can blame them? Those furry little scamps make their own place in the family, and we fall in love with them. So, it makes perfect sense that you might want to include your favorite four legged friend in your portrait session. But… no, there is no ‘but’. You should definitely include your dog in important photos. Not only are they important to you, they also say something about this moment in your life, and these are things that add layers of meaning and value to your heirloom-type images. 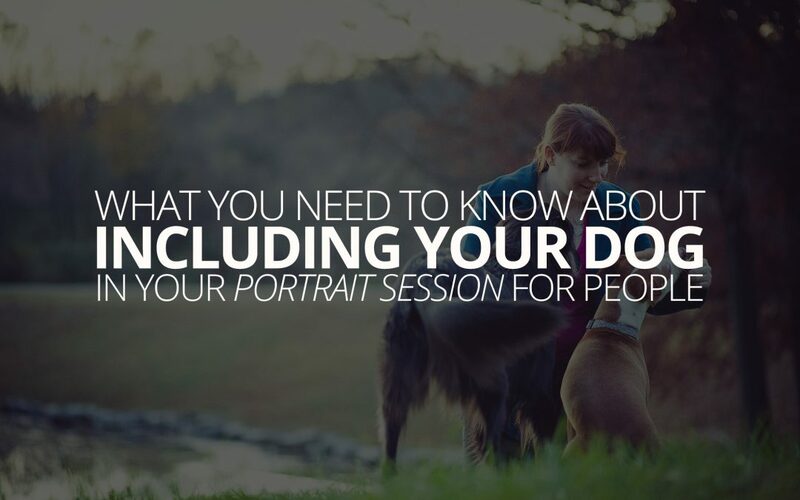 So, if you’re going to include your dog in your portrait session for people, there are some things you’ll want to know to make sure that you get everything you’re hoping for, without making the whole thing into a big headache. We’ll keep this short. By ‘handler’, I don’t necessarily mean a professional; this isn’t the Westminster Kennel Club or anything. A dog walker, or a family friend can do just as well. Basically anyone who can take the leash and keep the dog entertained in between photos will do the trick. The goal here is to prevent the dog from impeding other kinds of images we may want to take during the session. For example, what might make a great shot for the family alone, might not work with the dog for a variety of reasons. With a handler, we can detour and follow interesting and beautiful images where they may show up. Without a handler, however, we will be forced to filter our options by what can feasibly and safely include the dog. Also, rambunctious and energetic dogs can be unpredictable. Without a handler to take the dog aside, they can spoil an entire set of images by simply being too big of a distraction for the humans to ignore. You might think that this would go without saying, but based on how many dogs have eaten the granola bars from my camera bag, I’m thinking people might need a little reminder. Dogs are typically food-motivated. So, bring lots of treats, and give them out liberally to hold the dog’s attention and keep them from following their noses off someplace else. Using the treats, the handler is also usually able to help maintain the dog’s attention in the direction of the camera, and you’re able to focus on working with the photographer to look great in your images. If you’re like most dog owners, I’ll bet you have some leashes and collars with a lot of pizzaz. They’re cute and add some personality to the walk around the neighborhood. But, in a photo, they can be pretty distracting, and can cause the photo processing time to take a lot longer. It’s best, if possible, to bring a leash that is solid black, or dark in color, without a lot of details. You should also avoid the extending leashes, if possible, because the handle really stands out. It also encourages the dog to pull on the leash, which can slow a portrait session down considerably. If your schedule has the flexibility, I would suggest that you plan to take the dog to the park or for a long walk just prior to your session. A tired out dog is more likely to follow instructions, and more importantly, to be calm enough to work with predictably. Of course, you’ll want to avoid parks and walks that leave the dog in need of a bath. So, stay away from the beaches and muddy trails. A neighborhood dog park, or a couple miles on the leash will probably do just fine, and do wonders for the photos! It’s a great time to schedule a portrait session with your spouse or family, and it’s easy to include your dog. So, what are you waiting for? If you’re interested in scheduling a portrait session with one of our photographers, check out the Portrait Photography page here on our website!